After studying at the California Culinary Academy and various cooking stints, Chef Paul Poblador, along with his wife, Nina opened their first restaurant in Baquio, Salud Bistro. Following that success in October 2004, he took the culinary helm of his mother-in-law’s Laguna home and Kusina Salud was reborn. Here, Chef Paul creates dishes that he describes as,“modern renditions, interpretations and combinations of classic Filipino dishes”. My wife. She has been there since the beginning. She gave me my first cookbook: a pasta encyclopedia. Marco Pierre White’s White Heat: fabulous food, fab pictures and fab attitude. He’s such a rock star. Part time cook at the Aviary. I used to chop up their sisig all night. When did you decide you wanted to open Kusina Salud? My mother-in-law wanted to try doing business in San Pablo, Laguna as we were doing so well in Baguio as Salud Bistro (in October 2004 before the meningogoccemia scare closed us down in May 2006). What is your favorite item on the your menu? We used to love Slaughterhouse in Baguio: fresh meat and cow blood in the wee hours of the morning. In the States, Blondie’s Pizza in San Francisco: cheezy, sleazy and so American. In Manila, I would recommend Chef Ariel Manuel’s Lolo Dad’s. He’s in a league of his own. Okra, saluyot and other slimy veggies. To continue to serve good eats at good prices. That’s a recipe for success. We do want to expand but to expand while keeping our quality standards intact is the whole gastronomic experience we aim to consistently deliver to our customers. Please check their website for a map and directions to Kusina Salud. 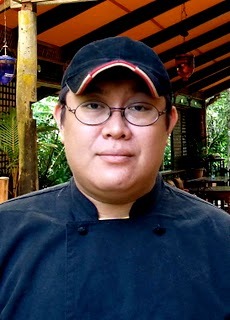 just wondering, can you guys ask Chef Paul if they have any plans to reopen Salud Bistro in Baguio? it was such a great-looking place, and very good food, too. chef paul!are you still teaching in Benilde? clarise dizon here.